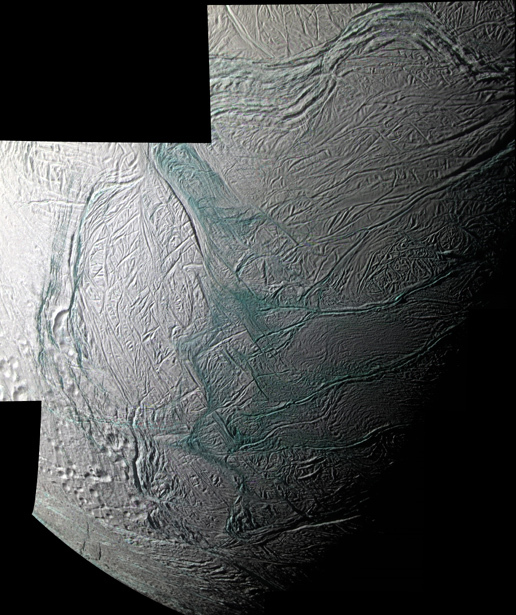 This sweeping mosaic of Saturn’s moon Enceladus provides broad regional context for the ultra-sharp, close-up views NASA’s Cassini spacecraft acquired minutes earlier, during its flyby on Aug. 11, 2008. See PIA11114 and PIA11113 for the higher resolution views. This false-color mosaic combines Imaging Science Subsystem (ISS) narrow-angle camera images obtained through ultraviolet, green, and near-infrared camera filters. Areas that are greenish in appearance are believed to represent deposits of coarser grained ice and solid boulders that are too small to be seen at this scale, but which are visible in the higher resolution views, while whitish deposits represent finer grained ice. The mosaic shows that coarse-grained and solid ice are concentrated along valley floors and walls, as well as along the upraised flanks of the “tiger stripe” fractures, which may be covered with plume fallout that landed not far from the sources. 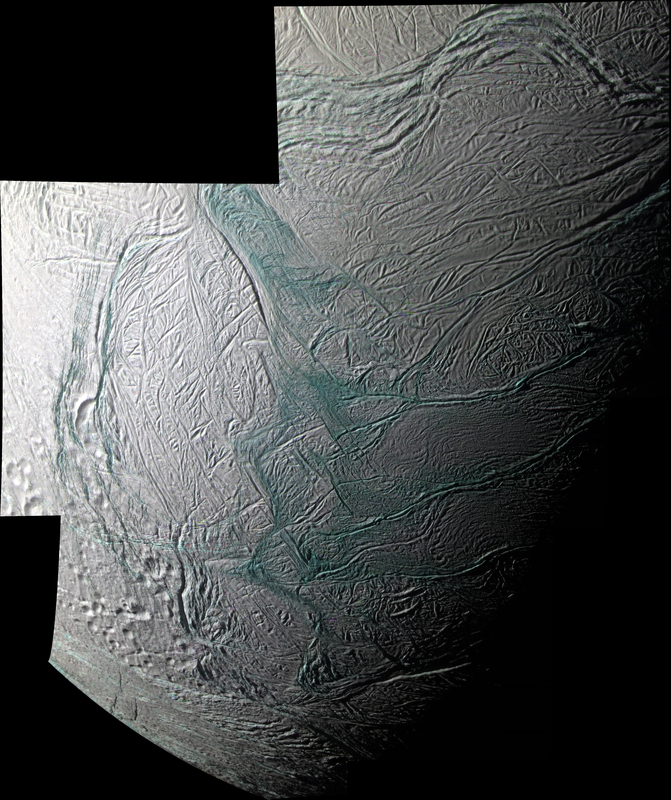 Elsewhere on Enceladus, this coarse water ice is concentrated within outcrops along cliff faces and at the top of ridges. The sinuous boundary of scarps and ridges that encircles the south polar terrain at about 55 degrees south latitude is conspicuous. Much of the coarse-grained or solid ice along this boundary may be blocky rubble that has crumbled off of cliff faces as a result of ongoing seismic activity. This mosaic complements the imaging coverage acquired during Cassini’s July 2005 flyby of Enceladus by showing portions of the moon’s south polar region and tiger stripes, or sulci, that were in darkness during that flyby (PIA06247). The reversed lighting conditions over the polar region (compared to the July 2005 images) highlight features, such as fractures and ridges, that are barely visible in the July 2005 views, and vice versa. The four most prominent sulci (from top to bottom: Damascus, Baghdad, Alexandria and Cairo) appear as generally horizontal fractures near lower right, and they extend into the moon’s night side. The mosaic is an orthographic projection centered at 63.0 degrees south latitude, 281.3 degrees west longitude, and has an image scale of 60 meters (196 feet) per pixel. The original images ranged in resolution from 28 to 154 meters (92 to 505 feet) per pixel and were taken at distances ranging from 5,064 to 25,949 kilometers (3,140 to 15,468 miles) from Enceladus.